If you're a fan of Hearthstone's Wild format, Blizzard has announced its first ever tournament for that format, and you could qualify. 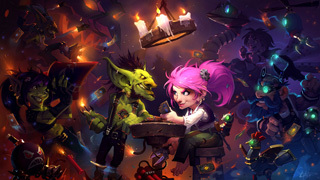 Hearthstone's Wild format gained a name about a year ago when Blizzard introduced Standard format to the game. Standard format limits which sets can be used in games, but Wild allows any card from any set to be played. Wild hasn't been used in any tournaments yet, but Blizzard is about to make that change, as it has announced the first official Wild tournament will take place later this year. The announcement comes via the Heathstone eSports Twitter account, and it also explained how you can qualify to participate in it. If you think you're good enough to make the list, all you need to do is play Wild. At the end of the May Legend ladder, the top 64 Wild players will be invited to participate in the tournament. Blizzard hasn't announced specifics for the tournament yet, so we don't know where or when it will take place or what the prizes will be. That said, the above-mentioned tweet says that those detail will be coming. Since the tournament will be filled at the end of May, it's likely we'll hear more soon. Until then, it would behoove you to start refining your very best Wild deck builds.